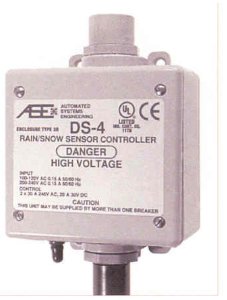 All W. B. Walton Enterprises heated Snow Shield de-icing systems are supplied with anautomatic local controller which interfaces with a moisture sensor and Thermister to monitor precipitation and temperature. This system provides the user with a versatile, yet inexpensivemethod of controlling the de-icing system. These systems were designed specifically to operate in high noise, low temperature environments, for added reliability. The DS-6 series of controllers were developedto provide a cost effective, automatic control system for Heated Snow Shields with Gas heaters or Electric heaters of 6KW or 12 KW. 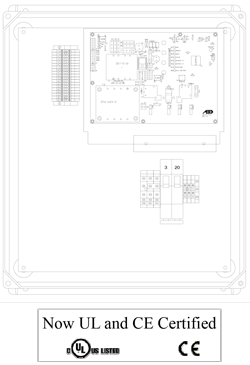 Similar to the DS-4 in operation, the DS-6 is ina NEMA 4X non-metallic enclosure whichhouses the DS-6 Printed Circuit Board, Terminal Blocks, and circuit breakers. These added items are required for the gas heaters and the larger electric heaters. The DP-7SS remote Monitor and Control/Status Panel provide a low cost method of remotely monitoring and controlling the DS-4 or the DS-6 De-icing Control Units. The DP- 7SS, mounted in a single rack unit (1.75 in. X 19 in.) panel with black finish to assure goodindicator visibility. The DP-7SS, which can be located up to 1200 ft from the DS-4 or DS-6, has a blower on and heater on indicator LED. Manual, Auto or Standby mode can be selected from the DS-7SS Panel. Dry Contact I/O’s are provided for interfacing with customer’s M&C System.